$18 General admission; $14 Senior/Students; Thursday shows are pay-what-you-will! Tickets may be pre-purchased on- line at http://bit.ly/2S4smNo or purchased at the door. 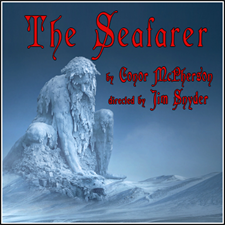 The Seafarer is a chilling play, infused with dark humor, about the sea, Ireland, and the power of myth. It is Christmas Eve in Dublin at the squalid home of the aging, cantankerous Richard. Richard’s brother, Sharky, recently sober, has returned to Dublin after losing yet another job to care for Richard, who was blinded in a drunken accident. At Richard’s insistence, his old drinking buddies and a mysterious stranger gather for a night of drinking and cards to celebrate the holiday. The stranger, bringing an ominous presence to the game, has come to collect on old debt with one of the players. The innocent card game becomes not so innocent, with the hands of fate played out in the cards! This production contains adult language and may not be suitable for all audiences. The play features a cast of five men: Peter Cook (Sharky), Michael Murdock (Richard), David Beegle (Ivan), René Schuchter (Nicky) and North Bend City Councilmen, Brenden Elwood (Mr. Lockwood). Directed by Valley Center Stage’s Artistic Director, Jim Snyder. Recent directing credits include The Cemetery Club, Over the River and Through the Woods, Steel Magnolias, two episodes of The Twilight Zone, 'Tis the Season, Superior Donuts, Caps for Sale! and The Mystery of Irma Vep – A Penny Dreadful. When not busy directing, Jim can be found building sets and managing a variety of tasks needed to keep the theater running!